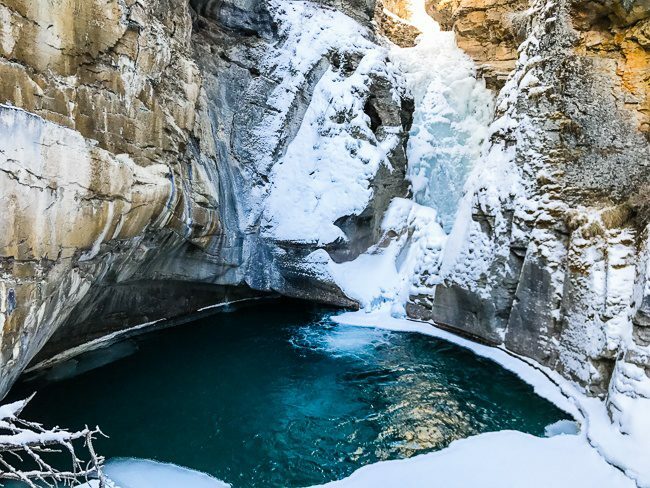 A Johnston Canyon hike is a popular Banff National Park thing to do in all 4 seasons. In winter, snow and ice transform the canyon, creating a gorgeous Narnia-esque winter wonderland. 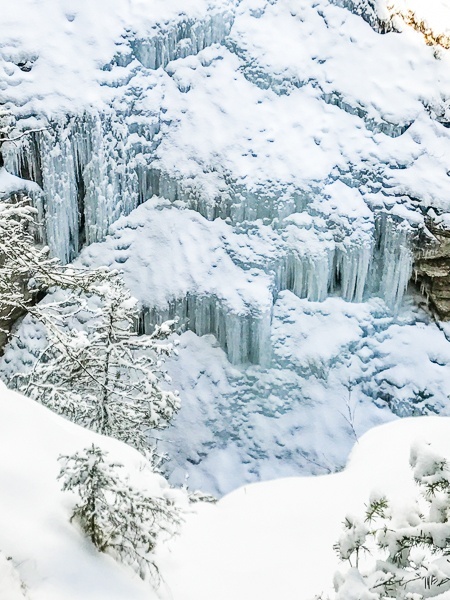 Complete with frozen waterfalls, a snow-covered forest, and a canyon dripping with icicles, it’s easy to see why the Johnston Canyon ice walk is one of the top things to do in Banff in winter! 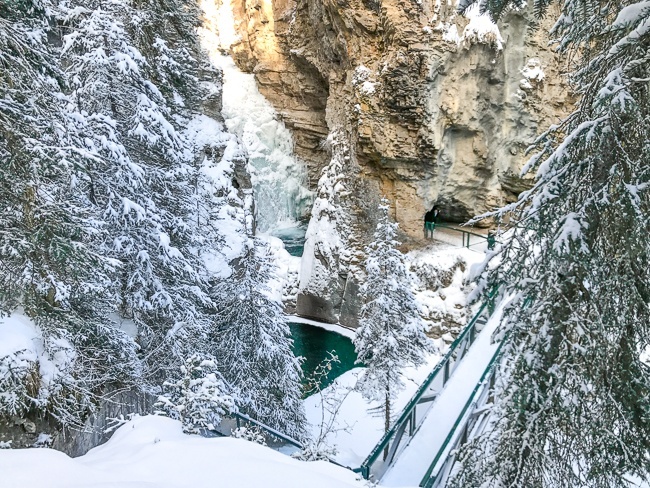 The Johnston Canyon trail is a combination of steel walking platforms and forest paths, which, in winter, will be covered in snow and ice. Large sections of the walk will be slippery so be sure to start off with your ice cleats strapped to your boots (more on necessary gear below). Early winter…I’d expect a deeper layer of snow and ice the later into winter you visit. 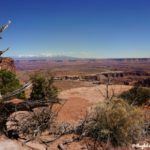 The flatter ground at the trailhead will give way to a gently sloping path as it follows the outline of the canyon. With just over a half mile of terrain to cover before reaching the Johnston Canyon Lower Falls viewpoint, it’s not long before the steel pathways cut into the canyon and bring you closer to the river. As soon as the temperatures drop, ice begins to form on the river and along the canyon walls. Walking alongside the river, I could see an ice ledge had formed. It was slowly covering the aqua-colored water until spring. Up overhead, icicles remade large sections of the rocky canyon in crystal blue and white. In some spots, the layers of ice were already several rows deep and winter had only just begun! You’ll want to make sure to visit both Lower and Upper Falls. The trails are well-marked so you know which way to go. At the split in the path, veer down to the right to see the natural pool of turquoise water formed from Lower Falls pounding the bed of rock and eroding the bottom away. You can walk through the natural arch for a close-up view of the frozen falls and the natural plunge pool. The icy falls encapsulated the cascading water but you could still see and hear the water pounding down behind the icy shell. 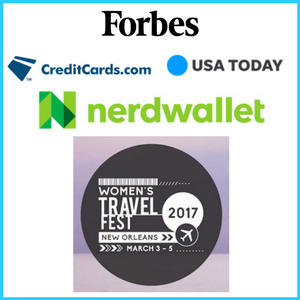 Research and book your hotels on TripAdvisor and Booking.com. I absolutely loved my stay at The Juniper Hotel. 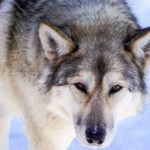 I’ve also had great stays at the Banff Aspen Lodge and the Fox Hotel & Suites. Once you’ve filled up your camera‘s memory card with photos 😉 , head back up the slope and continue along the original path toward Upper Falls. From this point, it’s about 1 more mile until reaching the platforms. The path slopes upward and it’s at this point, you’ll certainly recognize the value of those ice cleats. 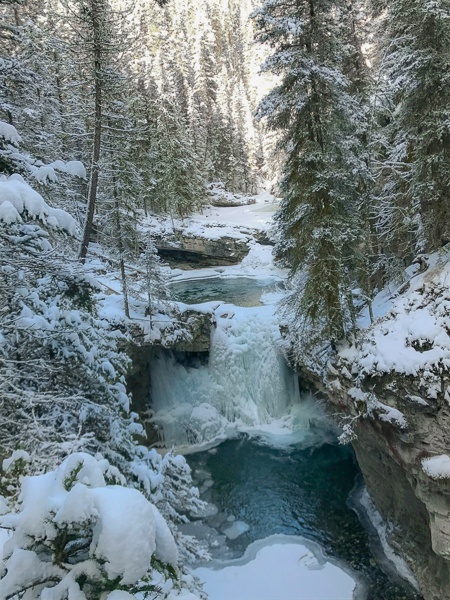 Although you won’t be as low to the river as earlier on the path, the higher perspective gives you better views of the snowy forest and other small waterfalls as you get closer to the Johnston Canyon Upper Falls. Upper Falls has 2 viewing platforms, one from below and the other a bit further up the path. The lower platform comes up first and gives you a dramatic look at the tall waterfalls frozen along the canyon. On most days, you’ll also find ice climbers practicing their skills as they claw their way up the frozen falls. Here the Upper Falls are the main attraction, but don’t forget to look at the river and the winding canyon! It just might be that one of the prettiest views is actually behind you. 😉 Banff National Park is gorgeous no matter which direction you look. 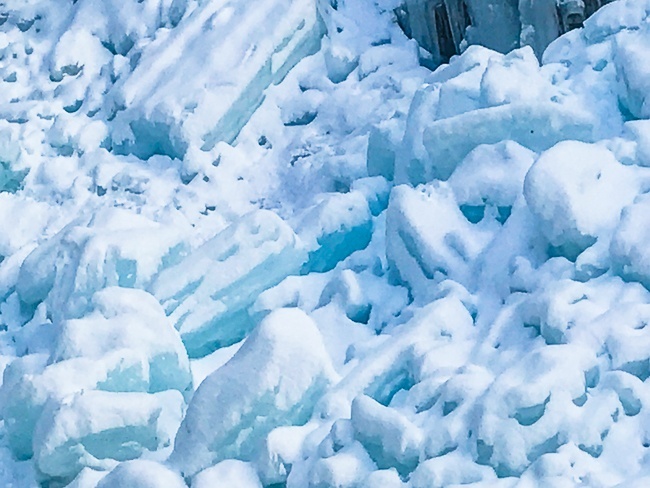 While the icy chunks at the base of the falls look like props straight from a movie shot in a winter fantasyland! 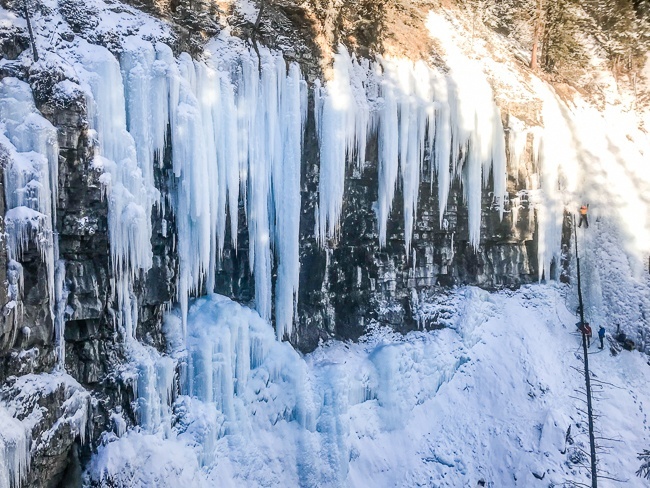 Be sure to go back to the trail and continue up to the higher viewpoint to see the perspective of looking down over the falls and at the icicles on the upper canyon walls. 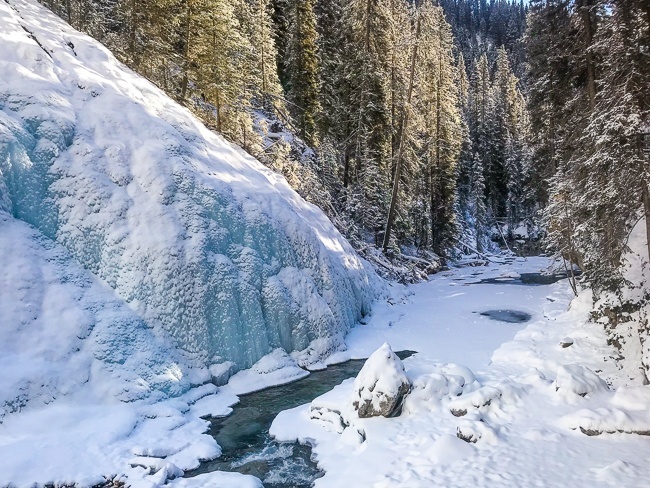 For winter hikers planning to see Johnston Canyon and the Ink Pots, five cold mineral springs that never freeze, it’s just under 2 miles more from the Upper Falls viewpoints. It’s also likely you’ll need to swap the ice cleats for snowshoes to make it possible to get through the deeper snow on this trail. 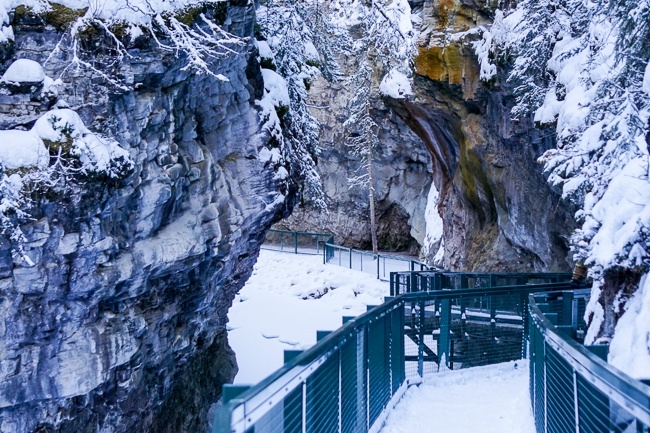 A Johnston Canyon winter visit comes complete with ice and snow. The steel walkways and forest paths will be covered and slippery. Still, it’s important to check the conditions for the timing of your visit. Parks Canada regularly updates their Johnston Canyon trail report so visitors can prepare accordingly. 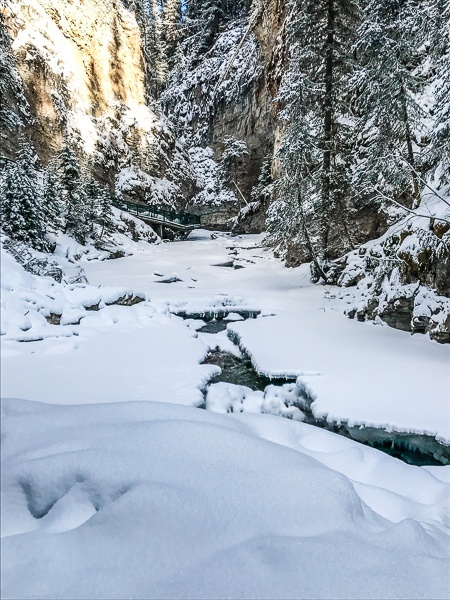 When’s the best time of day to winter hike Johnston Canyon? 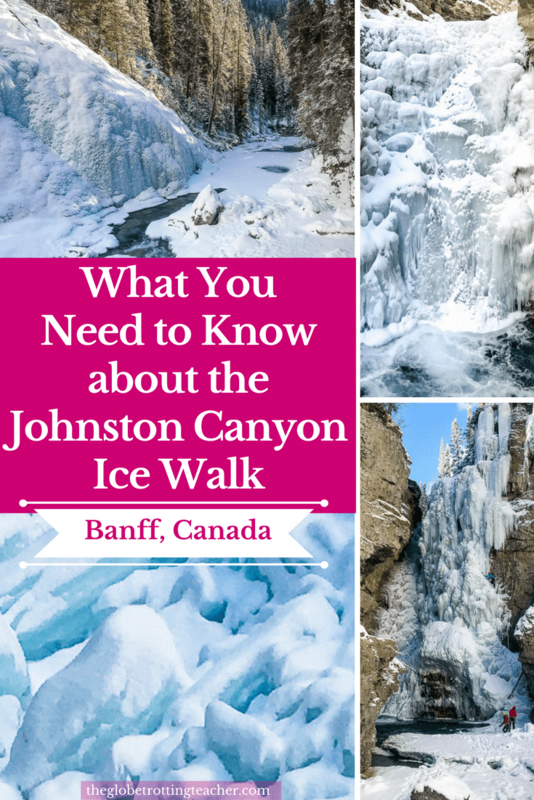 There are Johnston Canyon tours in the morning and later in the afternoon. Ideally, a window in between is best. Think late morning. Also, keep in mind the shorter winter days with less light than in summer. If you plan to snowshoe to the Ink Pots, you’ll want an earlier start to make sure you have plenty of time for the round trip before the sun dips too low. 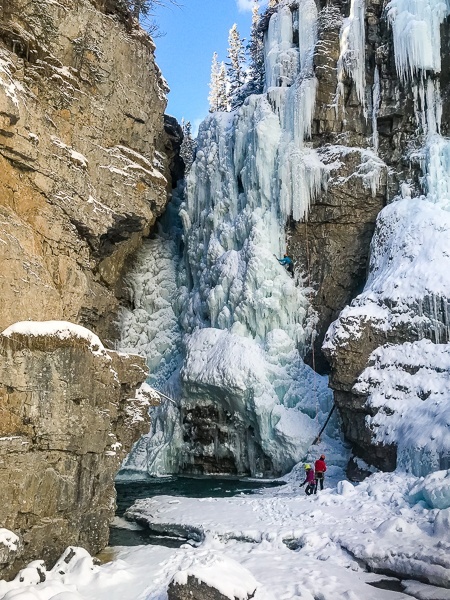 Johnston Canyon in winter can be a balmy 32°F/0° or much colder, dropping to the single digits Fahrenheit or minus teens Celsius. 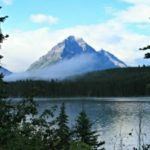 As with any outdoor winter activity, the right clothing and gear are what separates a fun, enjoyable time from a miserable time. Ice cleats are the only gear you’ll need or, potentially, snowshoes if a large amount of snow fell right before your visit and hasn’t been compacted down by other hikers. Walking poles (even ski poles, if you have them) can come in handy for the steeper sections of the trail. 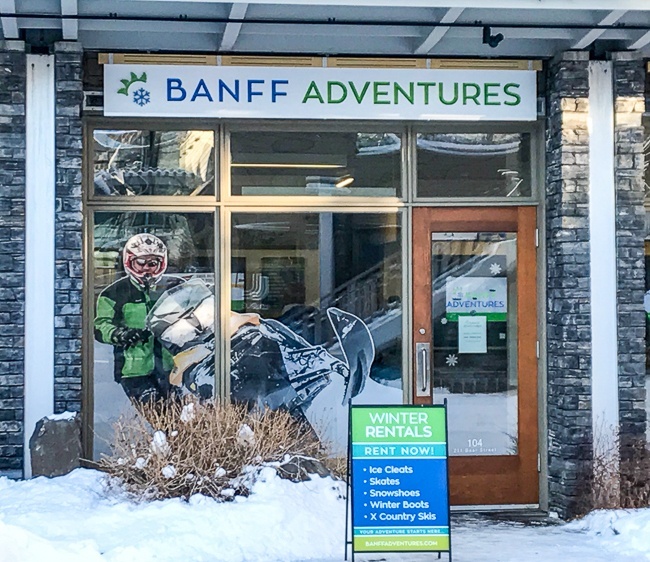 Ice cleats and poles can be easily rented at Banff Adventures in downtown Banff. 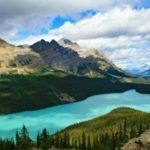 For those staying in the Lake Louise area, Wilson Mountain Sports in the Lake Louise Village is a good option for gear rentals. Layers are important, but especially winter base layers designed to trap your body heat. Outer layers should be able to resist wind and moisture. Think winter hiking pants or even ski pants. Johnston Canyon is icy. If you slip and get wet, jeans and leggings will absorb the moisture, freeze and make for a very cold experience. Wear waterproof winter boots with winter socks. Uggs, suede boots, and sneakers won’t keep your feet warm and dry in the Canadian Rockies. Cover your head, ears, and hands. Ladies, my readers love this winter headband. From Banff, get on the TransCanada Highway going west. Take the Bow Valley Parkway-Highway 1A exit and merge onto the Bow Valley Parkway. Head west for about 11 miles and the Johnston Canyon parking lot will be on your right. Don’t be confused by the left turn just beforehand for the Johnston Canyon Campground. ProTip! The Bow Valley Parkway is a popular Banff scenic drive and destination all to itself. Go slowly in order to take photos and look for wildlife! From Lake Louise to Johnston Canyon, the ride will take about 30 minutes. The fastest way is to take the TransCanada Highway going east. Get off exit 50 for the Banff-Windermere Highway toward Castle Junction. Turn left off the exit. Then take a right about 1 mile up the road onto the Bow Valley Parkway-Highway 1A. The Johnston Canyon hiking area will be on the left after about 4 miles. 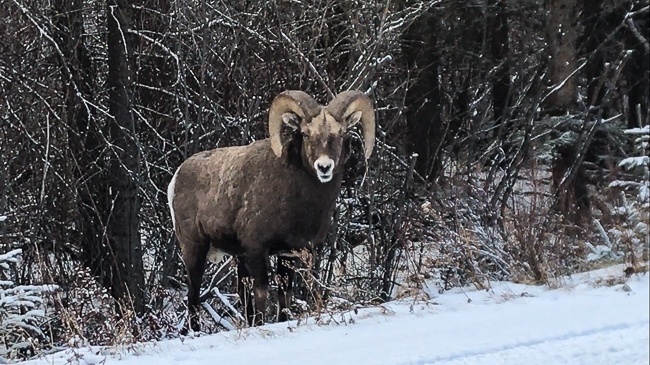 If you’re in the Lake Louise area and hoping to do some Banff wildlife spotting along the way, why not take the Bow Valley Parkway-Highway 1A directly to Johnston Canyon. It adds about 15-20 minutes to the drive (more if you stop to take photos!) and can be accessed by passing over the TransCanada Highway and turning right onto the Bow Valley Parkway-Highway 1A. 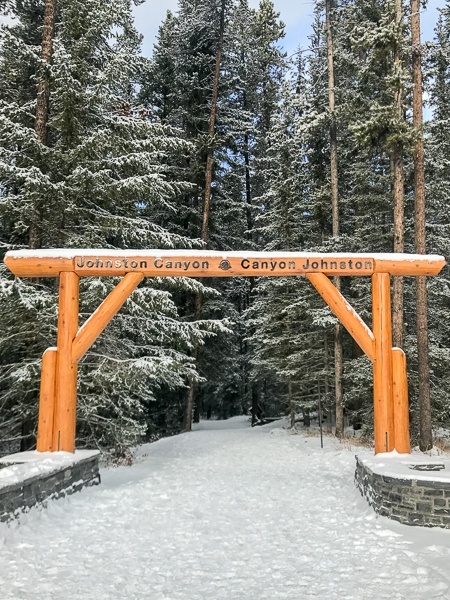 The Johnston Canyon trail will come up on your left. Johnston Canyon is suitable for all ages and levels of physical fitness, which makes it easily accessible to independent-minded travelers. However, if you haven’t rented a car for your Banff trip, you can book a Johnston Canyon tour. Going with a guide is also a great way to learn about the landscape. Keep in mind, tours typically complete the hike to Johnston Canyon Lower Falls. Make sure it’s included in your tour if you’d like to continue on to Johnston Canyon Upper Falls. To continue on to the Ink Pots, you’ll need to go independently. 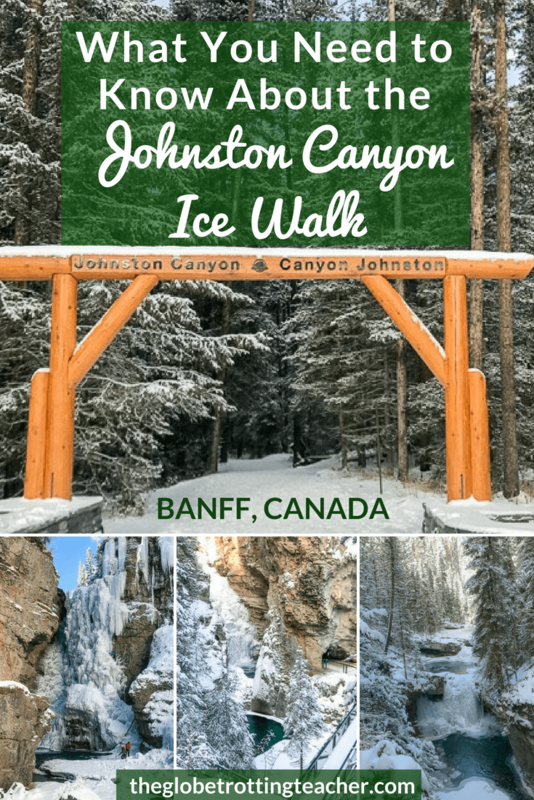 Would you like to do the Johnston Canyon ice walk? Save this guide for later. Pin it to your Pinterest travel board. Wow. This looks amazing. I’m adding it right now to my bucket list. I’m not a huge fan of the cold weather in general but I love iced and snowy landscapes… Such a contradiction! Your photos make me dream. Thank you for all the info and the tips! Fantastic, Eloise! I hope you can make it for a visit soon. Banff and Johnston Canyon are gorgeous in winter. If there are layers in the ice and it is only the start of the winter, I would hate to imagine how cold it must get when in the depth of the winter. It is definitely a sight to see in the winter, when it is covered in snow and ice. It must be incredible to see a waterfall frozen over! I thought the same, Beverley! 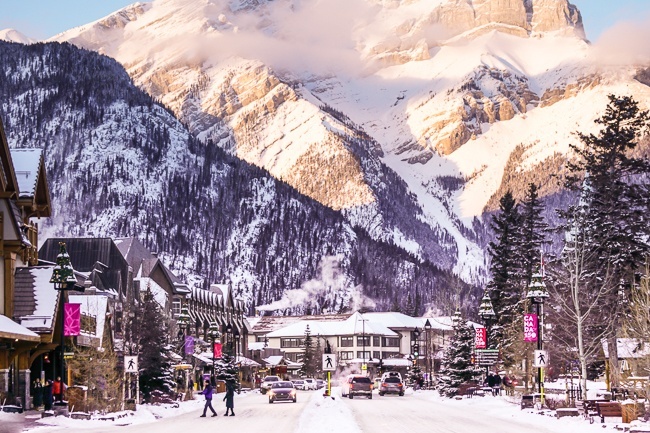 It was the start of winter and Banff was having a “milder” few weeks of temps just before we arrived. Definitely worth it though, regardless of temp, to see the frozen waterfalls in the canyon. Wow look at the frozen falls! I am not a fan of winter because I feel awfully cold but I do enjoy doing activities which take you through such breathtaking beauty. I love these views, the frozen ice and the blue water in between the white ice, it’s amazing. Not sure how easy or tough I will find it to walk through that, but I would love to do it anyway! 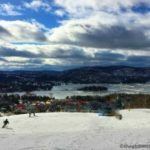 Great advice for a great holiday on the snow! love this white view and I miss so much because now I am living in a kind of desert! Sony alpha is it so good as well for making video? Two opposite landscapes for sure, Rocio! I’m not sure about video with the Sony A6000, but you would need to plug in a microphone. I did this hike a few years ago and loved it! I highly recommend getting cleats and poles from a place in town as well. I saw so many people just wearing tennis shoes and slipping everywhere! What a beautiful winter destination! I love how the waterfalls are frozen in time, such beautiful landscape. 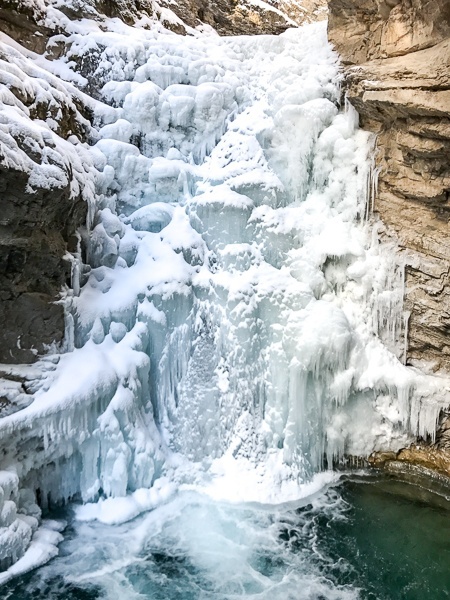 I think I have only seen summer photos of Johnston Canyon so it’s nice to see it in the winter time! Ice and snow, so simple, yet stunning! Hope you can see Johnston Canyon in person someday, Anita. Definitely not a fan of cold weather, but this gorgeous hiking trail might convince me to get out of my comfort zone. The photos are amazing, and I’m sure you had an amazing experience. I did an ice canyon walk in Jasper and it was one of the most magical winter experiences imaginable. I’d love to check out the Johnston Canyon, too, what a fantastic way of connecting with the Rockies. Frozen waterfalls always look so spectacular! I’ve been wanting to visit Banff for awhile now so this is just more of an incentive. I’m glad you mentioned the cleats because I wouldn’t have thought of using those. Yes, definitely get some cleats in town. Your body will thank you! Hope you get to Banff soon, Vicky! wondering how long to allow to do the hike – 2 hours? or more?? Thanks for reading. 2, 2 1/2 hours is good because that allows for taking photos, stopping to just enjoy the scenery, and making the full trip up to Upper Falls. Allow more time if you want to go on to the Ink Pots. Enjoy! My husband I are going there next week and I can’t wait. Thanks for this post. It helps a lot! Thanks for reading, Sydney. Glad the post was helpful and enjoy your trip!! Hi! I’ll be travelling with my husband and 3 kids (10, 8 and 5) to the ice walk in the next couple of weeks. Would enough ice have formed for us to view the amazing formations? All of the offered tours only allow kids 8 and above. I’m wondering why is there an age limit for these tours. Is the walk suitable for a 5 year old? If we choose to not go with a tour, can we bring our kids on the walk without a guide? Can we do a shorten version of the walk but still see some of the amazing formations? Hi! My family became a big fan of Banff since last visit and we have a plan to go back to there again at the end of December. We love to do Johnson caynon ice walk. Can we do without a guide? Because we like to ice walk along our paces. Our kids are almost adults. Thank you for this beautiful post!! Thanks for reading, Sarah. Banff is definitely a destination to revisit again and again. 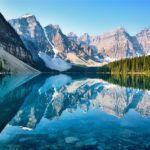 You can absolutely do Johnston Canyon without a guide as long as you have a car to get you there. 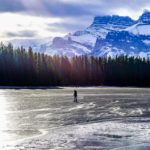 Don’t forget your ice spikes and enjoy Banff!! This is amazing. Going in a few weeks for my first time- are private tours available? Any recommendations for best gear to stay warm?? ?